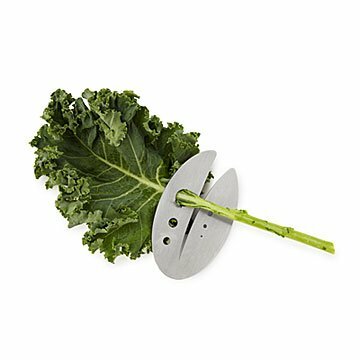 Marta Cornwell invented this nifty tool while making one of her favorite healthy snacks: Kale chips. Does this gadget de-stem your favorite leafy greens and herbs in a matter of seconds? Kale yeah, it does! Marta Cornwell invented the nifty tool while making one of her favorite healthy snacks: Kale chips. Her unique stainless steel design features a graduated slot for shearing leaves quickly, and three different sized holes that strip herbs as you pull the stem through. An excellent gift for health nuts, and friends who like their kale with a side of dinner. Made in Buffalo, New York. Marta Cornwell loves kale. As an industrial designer and ceramist in upstate New York, she knew there had to be a faster, more efficient way to bake her favorite kale chips, prep delicious salads, and cook herb-rich dishes. Marta put her expertise to use, and designed a nifty tool to sheer leaves from stems in a matter of seconds. With a successful prototype, she took the kale and herb razor to production in her Buffalo factory. Now, foodies and health nuts can enjoy their favorite garden fresh leafy greens and flavor-packed herbs in no time. Yes...well worth price because it works fantastically well. My daughter even sent me a video of her 6 & 8 yr. old using this and they were having fun doing it. This is a legitimate, scream from the top of my lungs, LIFE CHANGER. I avoided using fresh herbs (especially cilantro and parsley!) and kale leaves because of the effort and frustration I experienced while cutting them. I would change recipes before I would use fresh herbs. THIS FOR REAL WORKS, perfectly and I have been enjoying fresh herbs with EVERY meal since! Kudos! This product is great. Have started using more herbs & leafy plants in their natural form. Find the tool very useful & it quickens the job! Very easy to use! I have not had a chance to use this yet, but I am super excited about using it and getting more salads in my 2019 routine. Gave as a gift, ordering one for me!! Herb razor is perfect. Ordered as a last minute Xmas gift and it came just in time. Shears the leaves off easily and efficiently! This gift was much-appreciated by my mother in law who wanted an easier way to de-vein kale to make chips. I love to cook and usually bamboozle my husband into picking apart the herbs we use for cooking, especially thyme. This worked well for me with heartier herbs such as rosemary and Italian parsley. Thyme was a little difficult but still saved me time in the end. This item is s time saver for adding fresh herbs or kale to entrees. We put this to use the day it arrived and it was a real time-saver! Works very well on all types of stemmed vegetables and herbs.